A really refreshing summer sweet treat to have in the garden on a hot summer’s day. 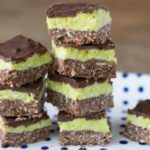 The chocolate and mint go together divinely with the coconut providing some substance and sweetness to the mix. Goes without saying that this treat is full of goodness nutritionally, as long as you don’t over indulge! Raw cacao powder is one of the best natural foods for minerals and mood- boosting properties, coconut is full of medium-chain triglyceride fats- healthy fats that burn off and give you tons of energy, and chia seeds boost your Omega 3 quota which is essential for health. Line a 20cmx20cm baking dish with baking paper. Mix all the base ingredients together well. Press the mix, using the back of a spoon or your hand, firmly into the tray, and place in the freezer to set for 5 — 10 minutes. Place all ingredients in high powered blender and blend until smooth. Smooth the mixture onto the base making it as flat as possible and stick back into the freezer for another 10 minutes. Gently warm coconut oil until it is melted and combine with maple syrup. Stir well. Pour over chilled bottom layer and return to the freezer for about 15 minutes, or until the chocolate layer is hardened. Once set remove from the tin and chop into little squares. Keep in a container in the fridge or freezer depending on preferences.